Powers/Abilities: Nick Fury was an experienced, well-trained and well-respected S.H.I.E.L.D. agent. An eye injury would have limited his depth perception. (Avengers United They Stand#2 (fb) - BTS) - Nick Fury received a serious eye injury while gathering information on a genocidal HYDRA plot masterminded by its aged leader, Baron Wolfgang von Strucker, to decimate humankind and leave only HYDRA agents. Twelve HYDRA defectors gave Fury details on how the plan would be implemented. Wary, Fury had S.H.I.E.L.D. check over the schematics and called in the Avengers to help. The eye injury prevented Fury from assisting in the next mission. (Avengers United They Stand#2) - Fury briefed the Avengers (Ant-Man, Hawkeye, Scarlet Witch, Tigra, Wasp, Wonder Man) and their government liaison, Agent Sikorsky. After the HYDRA plot was successfully stopped, Fury joined Ant-Man, Wasp and Sikorsky at a hospital penitentiary where von Strucker was being held. They watched the former HYDRA leader through the window as he lay conscious on life support; Fury smugly expected him to remain that way for the next two decades. Comments: Created by Ty Templeton (writer), Jason Armstrong (pencils) and Scott Koblish (inks). In issue 4, the Black Knight claims he stole his flying car from "a S.H.I.E.L.D. agent with a bum eye back in '95" (several years prior). 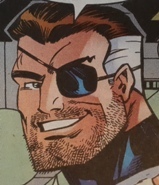 While this seems a clear reference to Nick Fury, his eye injury appears fresh in issue 2, which is at best several months before issue 4, not several years. Further, Fury blames von Strucker and HYDRA for the injury, so I'll assume the Black Knight meant someone else. S.H.I.E.L.D. agent Major Dugan led the clean-up of the Hydra base and ordered Sitwell personally arrest von Strucker. As ordered by Major Dugan, S.H.I.E.L.D. Agent Sitwell took von Strucker into custody.